With all phases of commercial and business printing, including catalogs, brochures, business forms, advertising and promotional products. Our goal is to provide our customer – with the service, quality products and management tools you need to effectively manage your business and marketing efforts. We can apply our many years of experience to assist you in identifying opportunities, increasing productivity and reducing total costs – with a lot less stress. 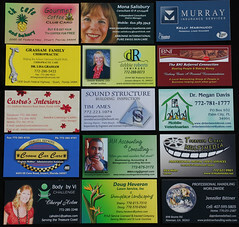 Personal Business Cards Printing Service, Palm City, Florida. BUSINESS CARDS are my specialty. Have an emergency? You have an event and NO business cards? What are you going to do? WORDS OF WISDOM, INC. will help solve your dilemma… We print cards in house at any hour just to help you make it to that event with a business card in hand that can help you promote your business. CUSTOMER SERVICE with a smile is what we are all about! I LOVE my job and design work is just the most exciting thing I could ever do! I WILL make YOU look your best and we will both benefit.. You have your business cards to promote your business and I have a new customer! Business cards are printed on some form of card stock, the visual effect, method of printing, co st and other details varying according to cultural or organizational norms and personal preferences. The common weight of a business card varies some by location. Generally, business cards are printed on stock that is 350 g/m² (density), 45 kg (100 lb) (weight), or 12 pt and now the most popular weight is 14 pt with or without UV coating.(thickness). High quality business cards without full-color photographs are normally printed using spot colors on sheet-fed offset printing presses. Some companies have gone so far as to trademark their spot colors (examples are UPS brown, Los Angeles Lakers’ purple, and Tide’s orange). If a business card logo is a single color and the type is another color, the process is considered two color. More spot colors can be added depending on the needs of the card. With the onset of digital printing, and batch printing, it is now cost effective to print business cards in full color. These names are pronounced as “four over zero,” “four over one,” or “four over four”. A business card can also be coated with a UV glossy coat (offset-uv printing). The coat is applied just like another ink using an additional unit on a sheetfed press. That being said, UV coats can also be applied as a spot coating – meaning areas can be coated, and other areas can be left uncoated. This creates additional design potential. Business cards can also be printed with a digital copier, which uses toner baked onto the surface of the card. Some industry leaders have begun avoiding the using the term copier in their literature, insisting their state-of-the-art machines are more like digital presses, than their office-oriented predecessors. UV coats, and other coatings such as Aqueous Coatings are used to speed manufacturing of the cards. Cards that are not dry will “offset” which means the ink from the front of one card will end up on the back of the next one. UV coatings are generally highly glossy but are more likely to fingerprint, while aqueous coatings are not noticeable but increase the life of the card. It is possible to use a dull aqueous coating on uncoated stock and get some very durable uncoated cards, and using UV coating or plastic lamination can also be applied to thicken thin stocked cards and make them more durable as well. Fold-over or “tent” cards, and side fold cards are popular as well. Generally these cards will fold to the standard size. are printed with English on one side and the local language (if not English) on the other.